Did you know that tooth decay is one of the most common chronic diseases for children in the country? Eau Claire Healthy Communities Oral Health Promotion Action Team has recognized this important health issue in our community and is committed to provide education on the importance of developing good habits at a young age, such as having regular dental visits, to help children to have lifelong healthy teeth and gums. According to the 2010 Burden of Oral Disease in Wisconsin, 35 percent of children ages 2-4 years old, and 55 percent of children ages 6-8 years old have had some sort of tooth decay-- treated and untreated. Tooth decay, if left untreated even in the earliest stages of life, can have a serious impact on a child’s health, causing problems that often last into adulthood. Tooth decay can affect a kid’s ability to sleep, speak, learn, and grow into a happy and healthy adult. According to the Eau Claire Healthy Communities Oral Health Promotion Action Team, tooth decay continues to be a problem for children in our community, but the good news is that it can be prevented. As children begin to learn how to brush their teeth, parents often wonder how much toothpaste their child actually needs. 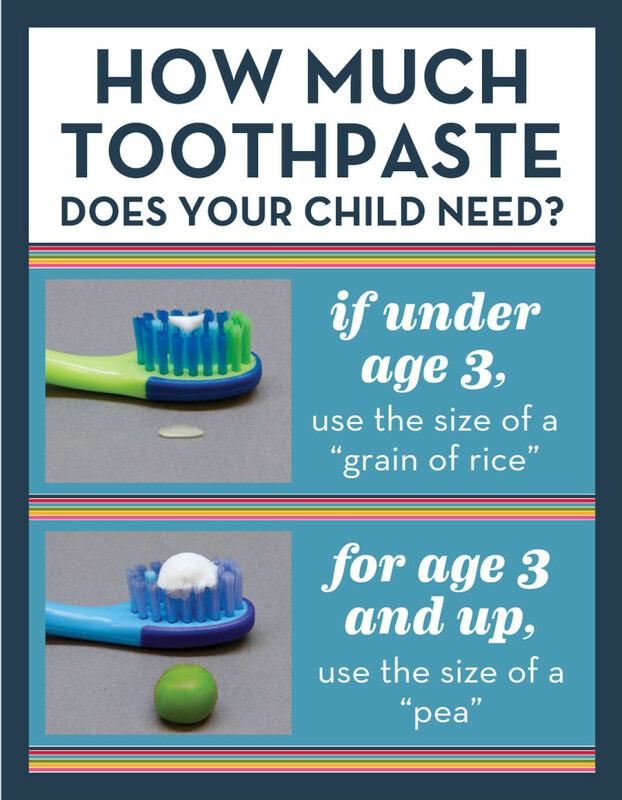 The image shows the recommended toothpaste amount for children by age. In addition to brushing teeth at an early age, the Oral Health Promotion action team also encourages families schedule a pediatric dental visit by their first birthday as a way to establish a ‘dental home’. Dental providers check for tooth decay and can give additional tips and information about how to prevent tooth decay so a child can have a healthy mouth and smile for decades to come.